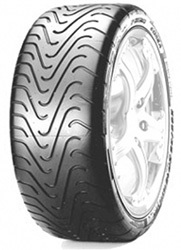 With their experience gained as the Formula 1 tyre supplier and in conjunction with renowned manufacturers Pirelli have developed one of the highest calibre of tyres we've ever seen here at Easywheels.co.uk. Scoring a top rating in all sizes for wet braking performance during EU tyre labelling tests and receiving top marks for performance in internal testing at Pirelli, the Pirelli P Zero Corsa system really is in a class of it's own. Produced in both directional (For front axels) and asymettric designs for maximum control.